The death has been announced of Sherwood Rowland - the US chemistry professor who first suspected that the Earth's protective ozone layer was being depleted by man-made chemicals. 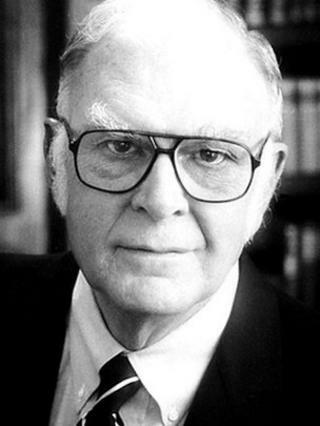 Prof Rowland published a paper on the dangers of the then-popular chlorofluorocarbons - CFCs - in 1974. His ideas were derided at the time by other scientists and especially the chemical industry. But 20 years later,Sherwood Rowland won a Nobel Prizefor his work. The University of California at Irvine (UCI) researcher - who was known as Sherry - shared the award with Mario Molina of the Massachusetts Institute of Technology and Paul Crutzen of the Max Planck Institute for Chemistry in Mainz, Germany. "We have lost our finest friend and mentor," said UCI physical sciences dean Kenneth Janda. "He saved the world from a major catastrophe; never wavering in his commitment to science, truth and humanity, and did so with integrity and grace." Rowland's and colleagues' calculations had led in the late 1970s to some restrictions being placed on CFCs, which were then widely used as refrigerants, propellants in spray cans, solvents, and blowing agents to make foams. However, it was not until 1985 and the discovery that the chemicals were initiating a severe depletion, or "hole", in the ozone layer over Antarctica that impetus was given to a treaty to ban chlorofluorocarbons - the so-called Montreal Protocol. Ozone is a molecule that is composed of three oxygen atoms. It is responsible for filtering out harmful ultraviolet radiation (less than 290 nanometres wavelength) from the Sun. The gas is constantly being made and destroyed in the stratosphere, about 30 km above the Earth. In an unpolluted atmosphere, this cycle of production and decomposition is in equilibrium. But CFCs and the other Montreal-restricted chemicals will rise into the stratosphere where they are broken down by the Sun's rays. Chlorine and bromine atoms released from the man-made products then act as catalysts to decompose ozone. "Mario and I realised this was not just a scientific question, but a potentially grave environmental problem involving substantial depletion of the stratospheric ozone layer," Rowland once recalled of his work. "Entire biological systems, including humans, would be at danger from ultraviolet rays." The Antarctic ozone hole, which appears in the austral spring because of the unique meteorology over the pole, is now relatively stable from year to year. The corresponding hole over the Arctic reached its deepest extent in 2011, but like the south is expected to recover long-term now that CFC use has been greatly restricted.